In Amusing, Cool, Culture, Current Events, Info Mgmt, Life..., Publishing, Sandbox, Social Web, Tools, Web Services, Yahoo! In Blogroll, Front End Engineering, Life..., Photos, References, Yahoo! Yesterday during our weekly YUI team staff meeting we headed outside to snap a year-end picture of the team. Here it is! 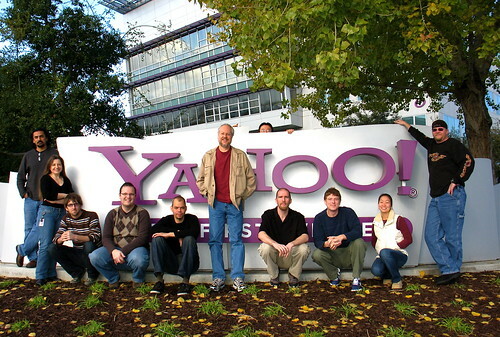 From Left: Satyen Desai, Georgiann Puckett, Nate Koechley, Lucas Pettinati, Adam Moore, Douglas Crockford, Thomas Sha (behind the sign), Luke Smith, Matt Sweeney, Jenny Donnelly, and Dav Glass. Not Pictured: Todd Kloots and Eric Miraglia. In Cool, Culture, Current Events, Engineering, Green, Yahoo! I know there’s a bit of a backlash against Green because its so trendy lately, but I can easily put that aside and be happy that things are changing. That takes on special meaning today because I just saw that Yahoo! is quickly following promises with real action, and making what seem to be excellent, well-researched green choices. When Yahoo! committed to going carbon neutral in April, we knew it would be a global initiative. … After much due diligence, Yahoo! has decided to offset its 250 thousand metric ton carbon footprint from 2006 through hydropower in rural Brazil and wind turbines in India. We’ve partnered with EcoSecurities and CantorCO2e, who helped us source, vet, and execute these projects.